Gilbane Building Company is proud to announce the promotion of Larissa Chevalier to a vice president. 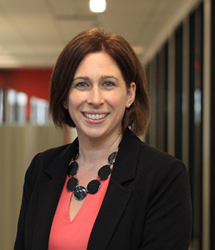 Larissa joined Gilbane in 2010 as a human resources manager for the New England division and Corporate, with experience in recruiting, succession planning and talent management. In 2014 she relocated to the Mid-Atlantic division and was promoted to global human resources director, leading talent strategy for Gilbane’s newly acquired global division. In 2017, Ms. Chevalier was promoted to senior human resources director to lead the newly created human resources business partner center of expertise. During her tenure with Gilbane, she has supported various strategic initiatives focused on engaging and retaining employees. She was instrumental in revamping the performance appraisal process, which now provides employees a streamlined review process that facilitates better dialogue between employees and managers. Ms. Chevalier also helped reorganize the human resources partner group to increase consistency across the department and deliver enhanced talent management services to internal stakeholders. Ms. Chevalier has a B.S. in psychology from the University of Delaware and a master’s in industrial organizational psychology from Westchester University. She is an SHRM Certified Professional (SHRM-CP) and a Professional in Human Resources ® (PHR®). In 2016, she graduated from Gilbane’s Executive Leadership Program at Babson College. In December, she will be speaking at the LEAP HR: Construction Conference in Dallas, TX on Gilbane’s redesigned talent acquisition strategy.